In an apparent reference to Pakistan, Rawat said that how the "neighbouring country" deals with terrorist organisation is their matter "but we will keep raising this". 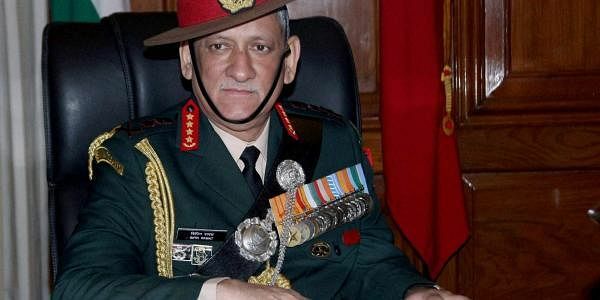 JAIPUR: Operations against militants in Kashmir will continue, Army chief General Bipin Rawat asserted today adding that while it was upto the "neighbouring country" as to how it treats terrorist organisations but India will continue to raise the issue. "Operations in Kashmir are going on continuously and we an improvement in the situation in the Valley. Such operations will go on," Rawat told reporters on the sidelines of a ceremony at Suratgarh military station. The security forces in Jammu and Kashmir have eliminated over 200 militants this year, the highest number since 2010. We do not want that such organisations are promoted, he said. Rawat was at the Suratgarh military station in Sriganganagar district to present the President's Standard to three regiments. The Army chief presented the Standard to 87 Armoured regiment, 47 Armoured regiment and 10 Armoured regiment after a mounted parade which was attended by south western Army commander Lt Gen Cherish Mathson, Lt Gen P C Thimmaya general officer commanding of Chetak corps and other senior officers. The chief hosts of the event were the Colonels of the Regiments of three Armoured regiments-- Maj Gen Vinod Sharma, Maj Gen S S Mahal and Maj Gen Kulpreet Singh respectively, according to defence spokesperson Lt Col Manish Ojha. A formation of T-72 main battle tanks, the mainstay of Indian Armoured Corps, displaying might of the Army was commanded by Brig Praveen Chabbra, commander of Sand Viper brigade with Regiment contingent commanded by respective commanding officers. The honour was bestowed upon the three Armoured regiments in due recognition of the dedicated and meritorious service rendered by them since raising, more than three decades back.